I don’t like to reproduce news from other sites, when I found something interesting on the web I share the source. Today, I will make an exception, why? Because this info is available only in Greek, at the moment. I love art, I love street art & this one is a very impressive work. A new graffiti, created by Gera 1 και Κolage artists , decorates the Law University of Athens. 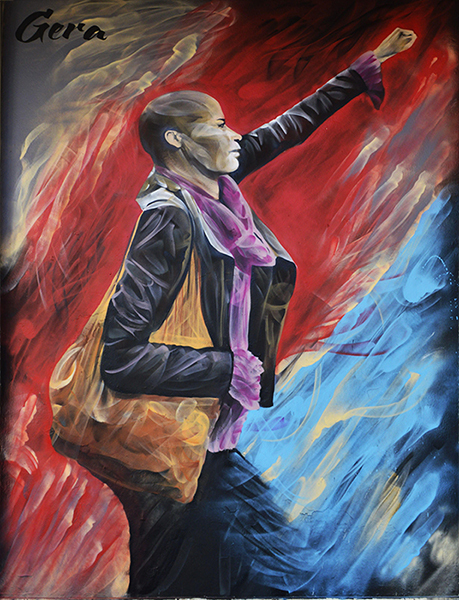 It depicts Tess Asplund’s photo who raised her fist in front of 300 neo-Nazis in Mai 2016. Tes Asplund were stood up against 300 Swedish, in May 2016. She stopped the parade & she raised up her fist. David Lagerlöf photographer captured this moment and his photo was circulated in media. Many people were considered that this photo would be the photo of the year.